With citrus greening devastating Florida’s $8.6 billion-a-year citrus industry, three University of Florida scientists will use $10.52 million in federal grants to study ways to help growers cope with the disease, including research on genetic editing that may produce potentially resistant fruit and trees. Since greening — or huanglongbing (HLB) — was first reported in Florida in 2005, Florida’s citrus production has shrunk by more than 50 percent, according to University of Florida Institute of Food and Agricultural Sciences (UF/IFAS) research. That’s why the federally funded research and Extension projects are so critical. The money comes from the National Institute of Food and Agriculture, a division of the U.S. Department of Agriculture, and goes to two researchers at the UF/IFAS Citrus Research and Education Center (CREC) in Lake Alfred, Florida, and one scientist on the main UF campus in Gainesville. Nian Wang, a UF/IFAS associate professor of microbiology and cell science who’s based at CREC, will use $3.6 million to generate non-transgenic, greening-resistant citrus varieties by editing genes that make citrus susceptible to the greening pathogen. Wang does this by using Clustered Regularly Interspaced Short Palindromic Repeats (CRISPR) technology. 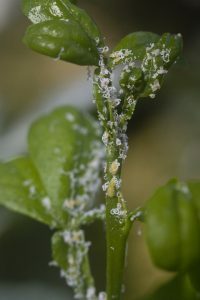 Small citrus trees infected with citrus greening. The goal of Wang’s research is to develop tolerance or resistance to greening in citrus varieties that are commercially important in all citrus production regions. He and his team are using strategies and objectives based on industry input. Gene editing is such a promising technology that two research groups at UF/IFAS have been funded, Rogers said. Zhonglin Mou, a UF/IFAS associate professor of microbiology and cell science in Gainesville, will use $2.95 million to develop greening-resistant or tolerant citrus trees by targeting negative regulators of the citrus immune system. “Restoration of the Florida citrus industry requires new trees that better tolerate the infection or reduce the spread of the disease,” he said. Arnold Schumann, a UF/IFAS professor of soil and water sciences, received $3.5 million to further his research on a screening system that protects citrus from the Asian citrus psyllid, the tiny bug that transmits greening to citrus trees. Schumann uses a system called citrus under protective screen, or CUPS. “Citrus greening makes it very difficult to profitably grow citrus with conventional methods,” Schumann said. 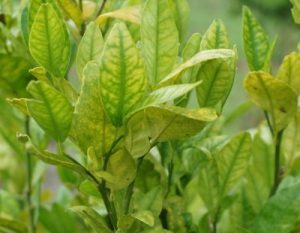 But UF/IFAS research has shown that high-yielding trees can be grown under protective screen structures to produce disease-free citrus by completely excluding the psyllid and therefore the disease, Schumann said.